Mulch is very important to your trees and plant beds. It insulates the soil to protect it from heat and cold temperatures, it retains water to keep the roots moist, prevents the growth of weeds, prevents soil compaction, and protects trees and plants from lawn equipment damage. Not only is mulch important for the health of your plants, it is also aesthetically pleasing to the eye at a lower cost than other alternatives. 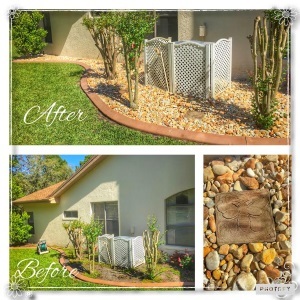 We can deliver and install your preferred choice of mulch through out Citrus County and also provide any weed killer & weed pre-emergent to ensure the best weed protection possible. The reason weeds are so prevalent is due to the fact that mulch is an organic material. Because of this when mulch decomposes over time it builds up a soil/nutrient layer on top of the fabric that enables weeds roots to establish themselves and grow more heartily. The best way to compete with these weeds is by checking the beds regularly and weeding as needed. Give us a call for your Free estimate. Bed edges redefined for a sharp crisp look, weed control and weed pre-emergent applied, mulch installed and all edges beveled by hand for a professional clean finished look. Mulch is spread at a minimum of 2" (unless requested otherwise). Bed edges redefined for a sharp crisp look, weed control and weed fabric applied, rock is installed and tampered for a professional clean look. Rock is spread at a minimum of 2" (unless requested otherwise).